Last winter, I received an email through my riverjunkies.com website from a guy in Halifax named Chris who found out he would be moving to the Ottawa Valley in the spring. He enjoyed surfing out on the east coast, and was researching what types of fun outdoor sports he could get involved in here in Ontario. He was very keen, and more or less wanted to know what kind of boat to buy (even though he had never whitewater kayaked before). I told him to wait until he got here, learn to kayak first, and then purchase a boat that would work best for him. Unfortunately, as he moved into the area, I ended up moving away to pursue a promotion and new position with my work. I advised him to go hang out with the Petawawa River Rats on Wednesday nights and they would get him hooked. 14-year-old Cody working on his loop at S-Bend! Keen! Last week Chris sent me an email asking me some questions about his progress. I realized that he might not be as secure in the boat he was trying as he should be, and so I told him I would bring a boat up on Saturday and take him down his first river run! The boat was perfect for him, and along with four other River Rats, we had an incredible day on the river. 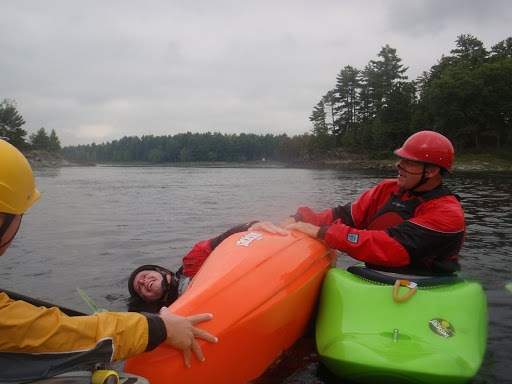 We have created another keen kayaker to say hello to on the river! Awesome!